Well, they DO look good enough to eat, but since these are real pearls which are dyed a rich chocolate brown, they really would destroy your teeth if you tried to eat one! 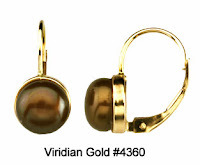 Quality cultured pearls make up our new Chocolate Pearl jewelry pieces. 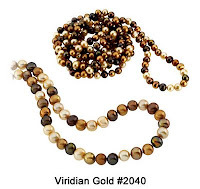 Each pearl shows its rich lustre through an equally rich chocolate hue--our 6-foot long Chocolate Pearl Rope Strand, #2040, combines darker brown color pearls with other earthy hues of golden browns and tans! Yes, you read that right--it is 72" long, so it can be looped several times for a dramatic look, especially when paired with matching 14K Yellow Gold Chocolate Pearl Lever Back Earrings, #4360! We have also added a more subdued, but still beautiful, matching 14K Yellow Gold Chocolate Pearl Station Necklace and Bracelet, #2106. And these pearls make a great addition to your jewelry box, because they are great for blue-jeans casual occasions, as well as casual-dressy and all-out glamour ones!